I’ve been really wanting a set of these and now I’ve found a fabulous deal on a Lock & Lock 32-Pc Food Storage Container Set BPA-Free, Airtight Watertight Seals ! This set retails for $59.99 but you can grab it right now for just $24.99 with free shipping. The BPA free containers stack for easy storage, are top rack dishwasher safe, and lock on four sides to make them air and water tight! 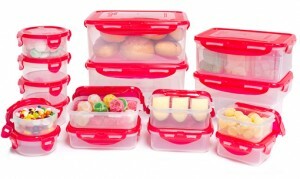 I LOVE these containers — my good friend has a set and she won’t use anything else!!! What a great deal! !